The Cloud Operais a performance about the human condition under the sky full of data. All the information gathered in the ´clouds´ is constantly above us and might rain down in the most unpleasant or surprising ways. The information clouds are as unpredictable and uncontrollable like the weather. We face a cruel fact – the nice and gentle sheep clouds no longer drive the angels around but are full of data – useful and useless, sometimes full of mere entropy. Once upon a time home for God and Chance, the cloudy sky now houses a bric-a-brac shop where one can go shopping or shoplifting, fishing for valuables or just drown in the noise. Chance has never moved away from there. That’s what the Cloud Operais about – manmade clouds as well as real ones, gathered by the winds, can surprise us by intervening at unexpected, and sometimes quite embarrassing moments. And not only with rain. The performance sets a contradiction between the intimate action of the vulnerable humans on the stage, and the massive potential for a cacophonic choir of volunteers which represent Big Data, the chaos in the cloud. Dramatic clouds – those who bring ill omen with them every time they appear and whose sudden departure calls forth a moment of happiness in conventional dramaturgy. There are multiple storylines that will intertwine through a kaleidoscopic and combinatory dramaturgical scheme. They all set sail whenever they decide to (when the invisible button switches itself on). The characters might get confused and, by accident, change stories. As a decent opera, the Cloud Operaalso has its basic myth – it is ´Dido and Aeneas´ that spreads its air roots onto all the other levels of the structure of the play. The ox skin that Queen Dido cuts into a fine string, in order to swindle the local king out of the necessary piece of land for settling Carthage, strangely resembles the ´cloud embassy´ project of the e-state of Estonia. The fascinating theme of the quest to finding the virtual State of Estonia, becomes inextricably linked in parallel to ´The Dido Problem´ and the Queen’s escape from Tyre and the founding of a new settlement in Carthage. The ´Dido Problem´ is known in mathematics as an isoperimetric enigma. With the show The Cloud Opera, Vaba Lava is collaborating with the Creative Lab of the Tallinn University Centre of Excellence in Media Innovation and Digital Culture (MEDIT) in developing innovative audio-visual applications in the performing arts such as virtual and augmented reality solutions. Liina Keevallik has studied scenography at Estonian Art Academy and holds a Ph.D. from the University of Paris 8. She has done set and costume designs in Estonian theatres as well as abroad (France, Belgium, Spain, Norway, Lithuania), her works ranging from big operas to underground avant-garde. She has worked as the head scenographer of Von Krahl Theatre and Estonian National Opera. She has also worked for film – designed feature and puppet films as well as directed films (Time. Wanted; the documentaries Wiiralt’s Dream; Romeo, Juliet and Jüri); written for theatre (Estonian Games. Wedding II), song lyrics and film scripts; directed visual performances like 100 Years of Traviata or the musical drama for the set Sentimental Education (with Sven Kuntu). She currently works as a freelancer in Paris and Tallinn, pursues her research in MEDIT, at the University of Tallinn. In 2016, she won the prize of the scenographer of the year 2016 in Estonia. Christina Batmanwas born in New York City and has lived in America, Iran, England and France. Her father was Iranian and her mother is an Irish-Estonian. She studied French literature and painting at the avant-garde Liberal Arts University «Bennington College» in Vermont, USA. Christina is a multi-faceted artist that works in theatre, music and film. She has made a number of short films with Jérôme Dupont. Their last film Hanaéwas one of the finalists for the 48h Film competition and was shown at the Samuel Goldwyn Oscar Academy Theater in Los Angeles and at the Ecological film festival Atmosphèresin Paris. She recently founded the group PARIS MASALA, a pop melting pot in which she is the lead singer; the project is currently in development. Her most recent work for theater includes the staging of the new piece Cette Femme Avec Qui Tu Crois Vivreby Natalie Rafal for the Fleming Welt Company and the recent co-direction of Pericles Prince of Tyreby Shakespeare. Mart Kampus is an Estonian actor, theatre director and lecturer of performing arts. 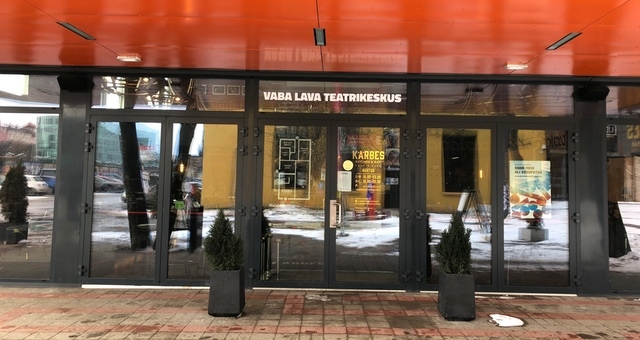 He has directed in various Estonian theaters: NO99, VAT Theater, NUKU Theater, Von Krahli Theater, Vanemuine, Municipal Theatre of Kuressaare and Rakvere Theater. He has been noted for sophisticated and multilayered children’s plays.